CLICK photos for larger versions! This picture shows Adriano's polyphase network which he intendes to use in an AM synchronous detector to suppress the unwanted sideband. He finds it quite lossy, with an input p-p of 1V but only 90mV out. Because of gain added to compensate for the losses the network is noiser than a 4-stage (8 op-amp) phase shift circuit built previously, and the performance inferior. The polyphase network has the first and second line inputs connected together to form one signal path, while the third and fourth lines are connected together to form the path for the INVERTED signal i.e. for the same signal, rotated 180-degrees (the two blue wires on the right, black is the ground). The five wires on the left are GND, +12V, +5V and the two outputs I and Q. The op-amp is a TL082 wired as unity gain, (all resistors = 100K). It takes the signal from 0-degree line and subtracts the signal from the 180-degree line, so doubling the output (Q). The TL082 2nd section does the same for the 90/270-degree lines so getting the I output. To check his Phase Shift Networks Adriano uses the Sine/Cosine generator pictured. It is built around a pair of switched capacitor filters and a standard 4013 connected as a divide-by-4. 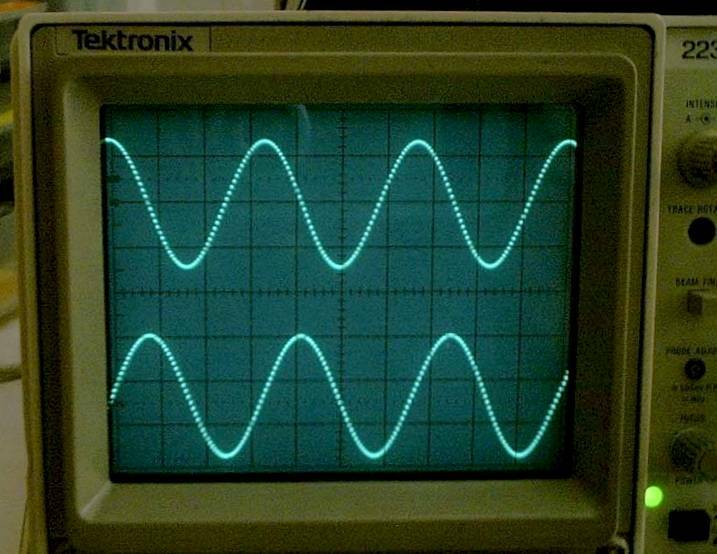 The scope image of the sine/cosine generator output shows the correct phase relationship and "staircasing" due to the switched capacitor filters. Normally, for recovering LSB and USB, the I - Q channels of the phase shift network are followed by summing and subtracting op-amps. To check sideband suppression, the network is fed with sine/cosine signals and the channels' gain trimmed for a null out of the subtractor and double amplitude signal from the summing op-amp. The circuit diagram of the sin/cosine generator is shown below. 1. Lissajous Figure (quite precise): Two sinewaves 90-degrees apart when fed to the scope X, Y inputs give a perfect circle ONLY if their amplitude is the same. 2. 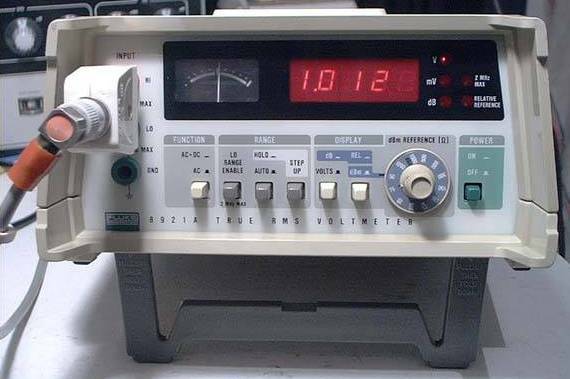 RMS Voltmeter (very precise): Alternatively the levels may be measured using a high accuracy RMS voltmeter, such as the one pictured below.